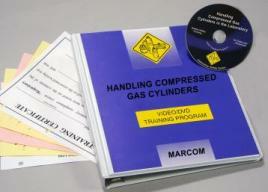 MARCOM's Handling Compressed Gas Cylinders in the Laboratory DVD Program examines how gas cylinders work, the hazards that are associated with them and the need for caution when using or storing a cylinder. The energy possessed by a compressed gas cylinder can make it a virtual missile if it is not handled with the utmost care. And a leaking cylinder or fitting can lead to asphyxiation, a fire or even an explosion. Since compressed gas cylinders are frequently used in many laboratories, employees need to be familiar with the precautions that should be taken when dealing with them. Areas covered in the program include the four ways to compress gases, hazards associated with compressed gases, proper storage procedures, marking and labeling, handling cylinders safely, connections and fittings, leak detection, and more. The DVD program comes with a comprehensive leader's guide, reproducible scheduling & attendance form, employee quiz, training certificate and training log. This DVD program is one of 12 in the Laboratory Safety Training Series.